Hotel du Golf is a fabulous 5-star luxury hotel situated in the heart of the magnificent La Palmeraie region where over 100,000 palm trees have been planted to create a beautiful lush green oasis offering breath-taking views. Truly a masterpiece by design and made with modern Moroccan art, this luxury hotel provides excellent facilities and services to its guests. The accommodation has been categorised as Standard rooms, Family rooms, and Privilege Suites, all equipped with essential amenities. The dining services at the hotel’s restaurants serve a range of traditional Moroccan and international cuisines. 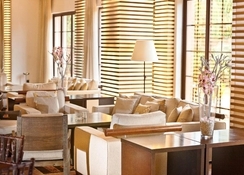 The lounge bar serves guests with their favourite beverages during the day. Marrakech centre is just a short drive away and many popular sites including the Jemaa El Fna Square where guests can enjoy watching street performers and snake charmers is close by. 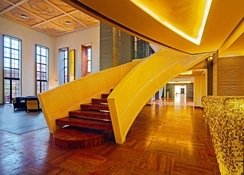 The hotel provides 24-hour reception, business centre, Wi-Fi service, and air-conditioning in all public areas. 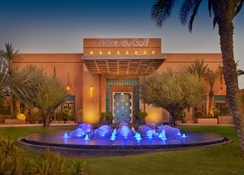 Hotel du Golf is located in Circuit de la Palmeraie in the region of La Palmeraie, Marrakech, Morocco. The Marrakech-Menara Airport is 10.6 km from the hotel. Other tourist destinations that are near the hotel include Marrakech Plaza at 6.7 km, the Bahia Palace at 7.2 km, etc. The train station is about 7.5 km from the hotel. Guests can also visit the 27-hole Palmeraie Golf Course which is just 300 meters from the hotel. 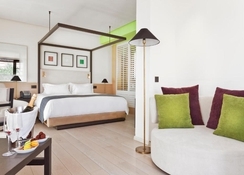 The hotel offers family rooms, standard rooms with and without views and privileged suites with an extra-large double bed. Family rooms have one double bed and one sofa bed in the living area. Standard rooms have one double bed or two single beds. All of these elegantly decorated rooms are well-furnished with air-conditioning, TV, telephone, desk, minibar, room safe, private bathroom with bathtub and shower, bathrobe, and hairdryer. Some services may be charged locally. 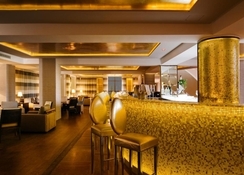 Guests can enjoy an exotic dining experience at the hotel’s fabulous restaurants. The Asian, Moroccan and Italian Restaurants serves delicious dishes and the pool-side snack bar serves alcoholic and non-alcoholic beverages and light refreshments. The hotel features swimming pools with sun beds, along with a separate kids’ pool. Fitness classes are held at the hotel’s fitness centre. Guests can take advantage of the spa and wellness centre where a variety of services such as steam bath, body wrap, body scrub, hair treatments, manicure, pedicure, beauty, and makeup services are available. There is a fun and entertaining kids’ club, a kids’ playground and endless entertainment programs for the whole families to enjoy. Golf lovers can also visit the nearby 27-hole Palmeraie Golf Course just 0.3 km away from the hotel (with local charge).